(C) 2017 World Surf Kayak Association. All Rights Reserved. Provide a standard measure to identify the people who exhibit the best skills in moving a kayak on the most challenging parts of the wave. The World Surf Kayak Championships are held every 2 years. The date of the contest will be announced 18 months in advance where possible, and will preferably not be in exam term time (May and June). 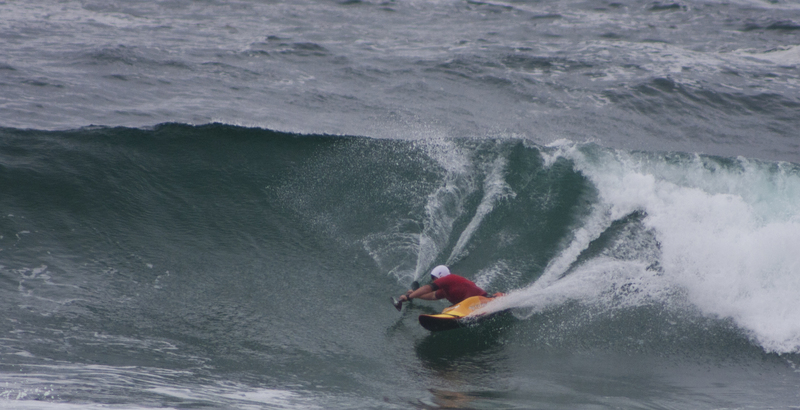 The contest usually runs over 8 to 10 days, allowing some time for rest or waiting for good surf conditions. There are Individual World Championship titles in 10 categories. There is an international Team World Championship. Long Boat – 3 meters or more in length, without fins. Originating from the longer kayaks first used in surf. Previously called “IC”, or the International class. Short Boat – 2.75 meters or less in length, with surfing fins. Previously known as “HP”, or the High-Performance class. Up to 5 competitors take part in each Heat. Each competitor can surf a maximum of 10 waves, they are scored by independent judges, and their best 2 waves count for the result. The highest scoring competitors progress to later rounds, until a Final heat determines the Champion. As well as finding the new World Champions, the event also aims to bring together the world surf kayaking community to socialise, share views and skills, and promote the sport worldwide. Proposals to host the event are invited from any Country which has suitable surf break(s), facilities and an organising team. A document titled “Guide lines for a proposal to host the Surf Kayak World Championships” is available on request from the WSKA. WSKA representatives will help in discussing ideas and supporting potential organisers make their plans become realistic, viable options. The proposal should be sent to the current WSKA Chairman. It should be received 2 weeks before the previous World Championship event – ie 2 years before the proposed event. The WSKA committee will review proposals for suitability. At the World Championships, there will be opportunity for representatives to present their proposal to competitors, Country Representatives and Committee. The Committee and Country Reps will discuss the proposals, and the Country Representatives will then vote for their preferred venue. To help with access and travel for all Countries, and to promote surf kayaking worldwide, there is a preference for each World Championship to be held on a different continent to the previous event. This is a preference, not a fixed rule. Proposals are invited for hosting the 2019 World Championships. If there is no Grand Master class, a Master is defined as age 40 or older on January 1st. To qualify for entry to the individual competition, competitors must either: have competed in World Championships before, be paddling in the Team event or have been on their Country’s ranking list (evidence required). Competitors may register in a maximum of 2 individual classes, unless the organiser decides they have space for extra paddlers. Entry numbers may be limited in some classes. A World Individual ranking list will be calculated after each World Championship, and used for seeding when drawing up first rounds for the next World Championship individual classes. First and second places in a heat will be split in the following heat where possible, to allow competitors to compete against different people and nationalities. All competitors will get at least 2 competitive Heats in each class. The competition organiser will try to stop competitor’s heats clashing with other heats in different categories they have entered, but this may not always be possible. It is up to each individual competitor to tell the competition director of any clashes. If a change is not possible, the competitor will have to decide which heat they want to compete in. Each Team represents their Country. The criteria for being classed as a Country will be determined by WSKA. It will usually require that area to have its own independent government, or be a distinct and significant surfing region. A person is eligible to represent either the country of their birth, the country of birth of either parent, or the country in which they have been continually resident for the past 3 years. A competitor must not change from one country to another during one year. Both team managers involved must agree with the change. A minimum of 6 people is required to form a Team. (6 people, not 6 heats filled by less people). Juniors must have different competitors for the long and short categories. Masters must have different competitors for the long and short categories. In each Round, any competitor can only compete in a maximum of 2 categories. For each Heat, points are awarded for positions (1 for 1st, 2 for 2nd etc.) a competitor must surf a wave (and so get a wave score) to get position points. No wave or a no show will score one more point than last place. Example A: 5 kayakers in a heat. 1 kayaker is missing, so they score 6 points. Example B: 5 kayakers in a heat. 1 kayaker stays on the beach, 1 kayaker goes in the water but does not catch a wave, 3 kayakers surf waves. Kayaker on the beach scores 6, kayaker with no wave scores 6. Other kayakers score 1, 2 or 3 points. The lowest Team score at the end of a Round is the winner. Alternates / Reserves; and submitting Teams. A Team may list up to 2 Alternates (Reserves) for each of the 8 Team categories. Therefore, on the full Team list there are spaces for 16 competing Heats and 16 Alternates. In theory, this could be 32 people. In practise, a full Team is often 10 to 12 people, with several competing in 2 categories, and many also being listed as Alternates in other categories. Before the Team event starts, every Country’s complete Team list will be published – this is the original entry list, including Alternates. This is so all Teams are clear who is in which Team and no changes can happen. For each Round, the Team Manager is free to choose his/her competing Team, from the named team members and alternates in each category. Before each Round, the Team Manager must submit to the event organiser, the names of their team members who will be competing in each category in that Round. If an Alternate is substituted after the Heats are announced, the person who is removed is no longer eligible to surf in the Team contest. If a person is substituted before the draw is made however, he/she is eligible to surf in the Team contest at a later date. The previous World Championship result may be used for seeding Round 1. Consideration should be given to Countries competing against as many other different Countries as possible. Each Country should compete a minimum of 2 Rounds. A Team’s competitors for each category should be randomly drawn to the Heats available. The running order for each Round will end with a Men’s class, not a Junior or Women’s class. Where the same Countries compete over 2 Rounds, the 2nd Round will run in a different order to the 1st Round. The competition is planned to end with a Final of 3, 4 or 5 Countries. A “Small Final” to allow Countries to compete for (example) 6th to 10th places should be run if possible. In the event of poor surf conditions and insufficient time, the format of the competition may be changed by WSKA and the event organisers. If this happens, the results of any completed Rounds may be used to determine the final results, at the WSKA and event organiser’s discretion. Each Team is invited to bring a large flag to be given to the organisers for display at official functions. Competitors must be current members of their National Governing Body and have full competition insurance. Competitors should complete Registration and pay entry fees no later than the published closing date, which is usually 1 month before the competition. Any exceptions to this will be determined by the event organisers. Competitors must read and sign the waiver form for the event organisers and WSKA. Competitors must be able to perform an Eskimo roll in rough water. Competitors maybe asked to prove this. Competitors must attend the initial safety briefing, and make themselves aware of rescue procedures. Competitors must ensure their kayak(s) and equipment are to the specified standards for inspection and for every Heat throughout the competition. Non-compliance may lead to disqualification. Competitors must report to the Beach Marshall prior to the start of their heat. Competitors are responsible for entering their Heat wearing the correct colour of bib, as determined by the Beach Marshall listings. There is no surfing in the designated competition area whilst another Heat is in progress. No instruction is to be given to any competitor who is in a Heat. This includes: no radios, flags or any other way to mark set wave positions, hand signals etc. Sanctions can be given to the competitor and/or the people signalling. Unsportsmanlike behaviour will not be tolerated by any competitor or by anyone acting on behalf of a competitor. This includes verbal abuse, physical attack etc. to anyone. Failure to comply with these requirements and responsibilities may result in sanctions or disqualification determined by WSKA and the event organisers. Acceptance of Risk. The event organisers will provide safety and rescue cover, and the competition committee will do their best to make sure that the contest runs in safe conditions. It is up to the individual competitor to decide if the surf conditions are within or above their own ability or not. If a competitor chooses to go into the surf, it will be at their own risk. The kayak shall be of hollow construction, with the paddler sitting in, not on, the kayak. Any material is allowed for construction. In addition, each kayak must utilize a fabric type sprayskirt / spraydeck, which completely encircles the paddler’s waist, and the boat’s cockpit, to attain “watertight” status from the waist down. The kayak will be moved around by the paddler using a paddle as the sole means for propulsion and steering. No other equipment may be used. This prohibits the use of sails, motors, propellers, rudders, foot pedals etc. to propel or manoeuvre the kayak. Long Boat: 3m (118”) or longer as measured in a horizontal plane. Short Boat: 2.75m (108¼”) or under, as measured in a horizontal plane. Long Boat: The hull may be any shape so long as the maximum concave depth under a straight edge, placed perpendicular to the long axis of the kayak at any point on the hull, is less than 10mm. There are no additional restrictions on deck design, hull radii or seat location. The kayak can have up to 4 fin boxes, so long as there are no fins in them. Fin boxes must be covered OR empty, and may be no longer than 25 cm and no wider than 2 cm. All designs must also satisfy the safety rules. The organisers retain the right to disqualify any craft, if its shape is deemed dangerous and disallow any other equipment that does not meet the competition committee’s interpretation of the rules and its equipment specifications. The Competition Committee will have the final decision on any dispute, based upon whether any non-conformance is due to a bad repair/warp or a deliberate attempt to break/bend the rules or unsportsmanlike behaviour. Kayaks Must Not have an “Extended End”: Kayaks must be more than 10cm wide, 10cm back from the front end of the kayak in plan view. All kayaks must have tails fitted. Tails must be at least 20cm long with a knot in the end, must reach past the end of the kayak and must not form an entrapment (i.e. no loop that a finger or hand can fit through). The tail, if webbing, must have a minimum width of 25mm; if rope, must be 8mm diameter or more (as measured, not manufactured). Tails must be of permanent attachment so not to break off when used. Buoyancy Aids / PFD’s (Personal Flotation Devices) or Impact vests are required to be worn while surfing in the competition. Inflatable life jackets are not allowed. Your country’s governing body must approve PFD’s and Impact vests. It must have an official flotation rating, equivalent to EN/ISO 12402-5:2006, this requires a floatation of 50N. This may be checked at the contest. A surfer must execute the most radical controlled manoeuvres in the critical section of a wave with speed and power throughout. The surfer who executes such manoeuvres on the biggest and/or best waves shall be deemed the winner. Judges expect to see changes of direction of the boat on the wave. Such manoeuvres would include bottom turns, re-entries, cutbacks, floaters, aerials, tube rides, top turns, late take-off’s, trimming and stalling, etc. How radical they are, followed by the amount of control and commitment put into each of them, will determine how high they will score. In particular, judges are looking for the bigger, more radical, manoeuvres, with top to bottom surfing (rail to rail) rather than top and bottom surfing (single rail). A slash is a good stall manoeuvre but is not rail to rail surfing and will be scored accordingly. Turns need to be fluid and not flicks for high scores. A surfer must complete a manoeuvre for it to be scored. It will not score well if they lose control or are not able to continue on the wave. Higher scores occur if the surfer stays in the critical section of the wave, the “pocket” closest to the curl. The degree of commitment and the risk involved in performing close to the curl is the reason that it scores higher. Wave selection is a critical factor for a surfer in their heat. The waves selected will dictate the manoeuvres they are able to perform. There is less emphasis put on wave size in small to medium conditions due to the fact that the best waves may not necessarily be the biggest. However, in a contest with big wave conditions, a large part of the criteria would be the size. A surfer should be prepared to demonstrate the greatest commitment to the critical part of the wave. A surfer does not automatically score high because of wave size or quality. What the surfer does with the wave is the more important criteria. Long Boats: More emphasis is put on large carving type manoeuvres with longer rides. Note that the longer the ride, the more potential time to score points, so the higher potential score, in both categories. In poor surf conditions, judges concentrate on surfers who are utilizing the mini power-pockets on the wave with explosive moves that are normally timed to occur at each of these spots on the wave. Higher scores will occur if manoeuvres are being linked directly to another without paddling all the way to the next section. Once a paddler has entered the white water (unless it is part of a manoeuvre), the wave will be deemed as over unless a proper shoulder is regained. To determine interference, the judges first decide which surfer has the right of way as a situation arises. The judges then determine whether the surfer with the Right of Way has been possibly hindered in his scoring potential. The key word in these criteria is “possibly.” If the judge has to consider whether or not they have hindered the other surfer, then they have possibly hindered the scoring potential of the Right of Way surfer, so the interference must be called. Which surfer has the Right of Way? At the take off point, the inside surfer always has unconditional Right of Way. Was there interference or not? Did the surfer with unconditional Right of Way have his scoring potential possibly hindered? What rule in the book reflects to the infringement? Drop-in, snaking, paddling, breaking down a section, or excessive hassling? The surfer deemed to have the inside position for a wave, has unconditional right of way for the entire duration of that ride. Interference will be called if during that ride, a majority of judges feel that a fellow competitor has possibly hindered the scoring potential of that surfer deemed to have the Right of Way for the wave. Anyone who surfs in front of a surfer with the Right of Way has the chance to kick out of the wave without being called for interference, unless he/she hinders the scoring potential of the surfer with the Right of Way by any means including excessive hassling, hindering progress, or breaking down a section. Point Break (Single Direction Wave) – The inside surfer has unconditional Right of Way for the duration of that wave. Single Peak (Left & Right Breaking Wave) – The surfer considered to have the inside position at the initial point of take-off has unconditional Right of Way in the direction he chooses by making an obvious turn. A second surfer may surf in the opposite direction. Beach Break (Multiple Random Peaks) – Two separate peaks that eventually meet, then both surfers are required to kick out of the wave or straighten out to avoid collision. If they both give way by cutting back or kicking out, so that neither is hindered, there will be no penalty. If they cross paths, collide or hinder one another, the judges may penalize the surfer who has been the aggressor at the point of contact, or may penalize both surfers. If neither surfer gives way, by cutting back or kicking out, and both share responsibility for the confrontation, then a double interference will be called. 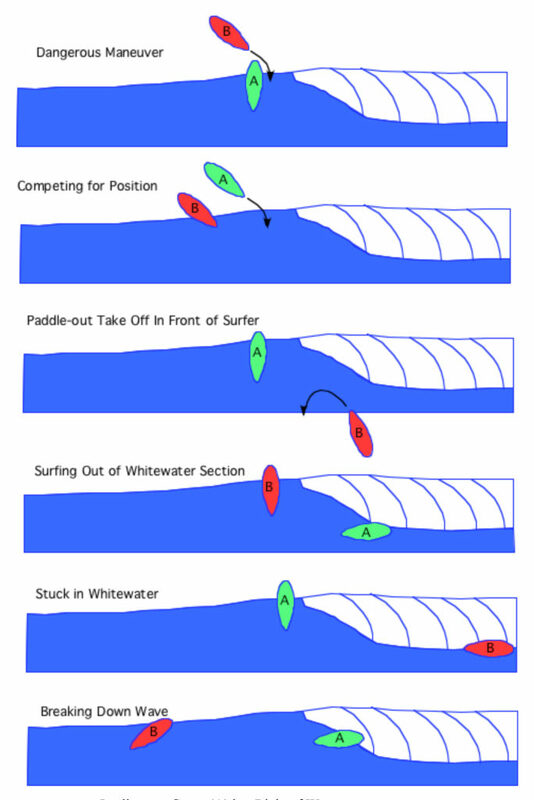 The offending surfer makes contact with, or forces the inside surfer to change his line while paddling to catch the wave causing possible loss of scoring potential. The offending surfer obviously causes a section to break down in front of the inside surfer, which would not normally have happened causing loss of scoring potential. When a surfer is put in a position while paddling out that he cannot get out of the way and a collision happens due to this, it is up to a majority of judges to call interference based on whether it is felt to be accidental or not. Note: If two or more paddlers collide there must have been either dangerous surfing or poor judgment from at least one of the paddlers involved. If one of the paddlers is not at fault for the collision, then both/all the paddlers must have an interference called against them. This is to enforce safety as a prime directive of the sport. 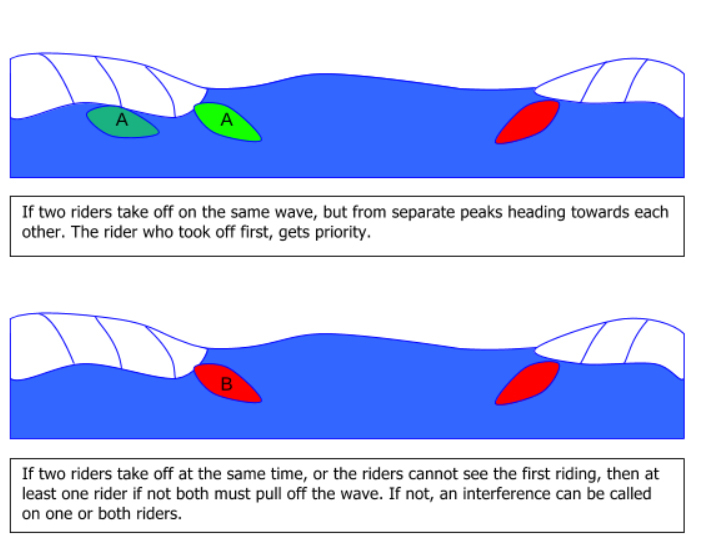 The surfer who is farthest inside at the initial take off point is entitled to that wave for the duration of his ride. However, if a surfer takes off on the white water behind the first surfer, he will be penalized if the surfer taking off at the peak is forced to pull out and loses the wave. (Note, this does not prevent behind-the-peak take offs started in green water). The Right of Way rule says that the surfer closest to the shoulder has the right of way. Judges expect that there will be jockeying for position on some waves. However, paddling in front of, around, or behind a competitor who is closest to the shoulder and is about to take off on a wave, in order to impede the competitor and take possession of a wave, is considered to be snaking, and will result in an interference call. If the wave breaks in front of the paddler and they get stuck in the white water before managing to paddle around the white water, then right of way to paddler 2, also known as snaking. Paddler 1 heads right and paddler 2 left. Paddler 1 then turns 180’ to head left towards and behind paddler 2. If the wave has not broken, then paddler 1 will be closest to the shoulder when it breaks, then right of way to paddler 1. If the wave is barrelling and paddler 1 heads through the barrel (backdoor), then right of way to paddler 1. If the wave breaks but paddler 1 cleanly surfs around the breaking wave but not going through the white water, then right of way is paddler 1 but allowances need to be given that paddler 2 may not see paddler 1, and also paddler 1 could be caught for dangerous surfing if they surf towards the other surfer where surfer didn’t expect to see anyone. Competitors may have assistance emptying their kayaks and re-launching while the Heat is in progress. But if you are rescued by the rescue boat, ski or Lifeguard, this will be the end of your Heat. Points already gained will stand, but no more points can be earned in that Heat. The penalty for interference with 2 wave scoring is that the competitor loses half their lowest scoring wave from that Heat. If a competitor commits 2 interferences or more in a single Heat, they will be disqualified from the Heat. This will be the end of their Heat, their scores will only be counted until the second interference. If the judges, WSKA or contest organizers believe that a competitor is purposely trying to disrupt the competition, is constantly causing interferences, or is acting unsafely, unfairly or in an un-sportsmanlike manner, the competitor can be disqualified from the competition. Competitors have a right to protest. Only clerical errors will be looked at. No protest will be heard against a judging decision. No video footage will be submitted. The protest committee will decide the result of the protest. The protest committee will be appointed from the event organisers and WSKA, and displayed before the start of the event. The cost of a protest will be set by WSKA and the event organiser at the start of the contest – a guide is £20, €30 or $30. This 2017 version is re-formatted and short explanations added for clarity. The Rules are wholly based on the 2015 Rules written and developed by P Blenkinsop, in conjunction with WSKA, for the WSKA. The only official version of the rules is this English version. This is to prevent any confusion or change of meaning by translation software. Must have rounded ends: All kayaks must have a minimum diameter of 50mm (allowing for 6mm protuberance) in the plan view at the front of the kayak. Take a thin sheet of wood or plastic at least 75mm x 75mm that is preferably square. Drill a 50mm circular hole at the centre point. File edges to protect fingers and boats.